Purpose: This modification will replace the factory air box lid/silencers and the mass-air-flow housing (MAFH). 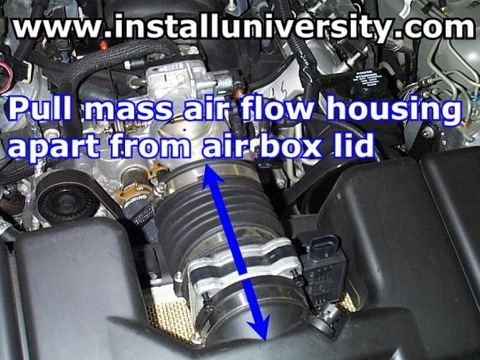 This will smooth out and increase airflow through the air box lid and MAFH giving your car some extra horsepower. 1. 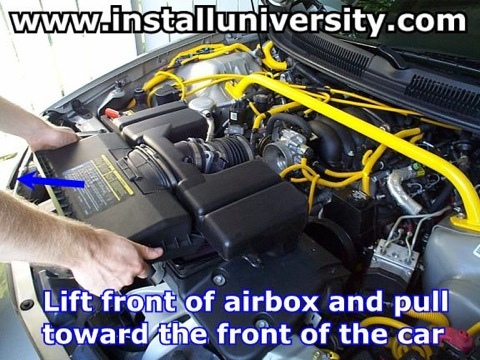 Open the hood of your car and look in the front and center of the engine compartment. Locate the air box lid metal clamps (see blue arrows in Figure 1). 2. 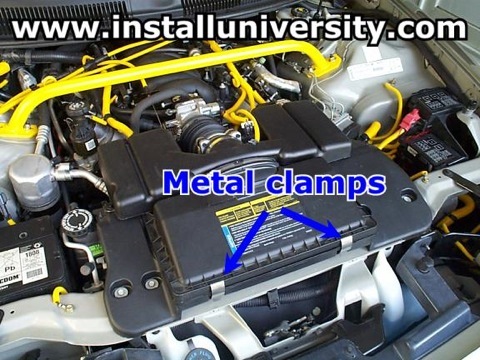 Go ahead and undo the air box metal clamps (see blue arrows in Figure 2). 3. Now you will have to remove the two plastic clips that hold down the air silencers (see blue arrows in Figure 3). Refer to Figure 4 for the three-step process to remove a pushpin. A. 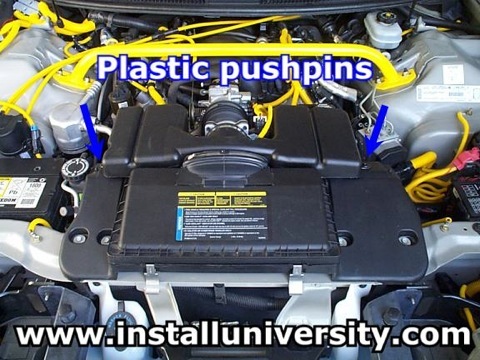 Locate the pushpin on the driver's side of the air box assembly. B. Place a flat-head screwdriver underneath the head of the pin while holding down the "collar" portion with your thumb. C. Pull pin up and remove. Make sure to keep the clips just in case you need to replace your factory air box lid for a trip to the dealer or other need. If you do break the clips they come in packs of ten (10) and are really cheap. The GM part number is 12551599. 4. 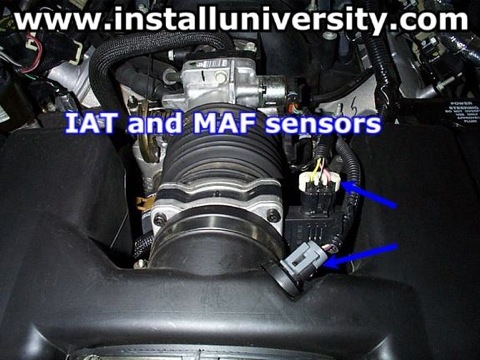 Locate the intake air temperature (IAT) and mass-air-flow (MAF) sensors (see blue arrows in Figure 5). 5. 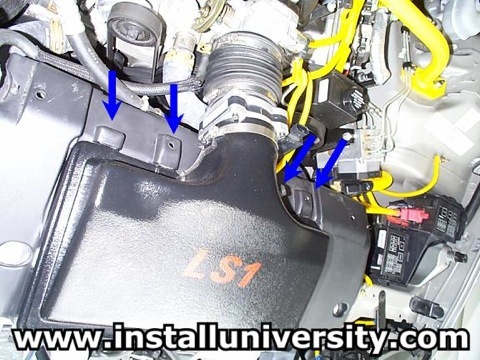 Remove the two sensors from the air box assembly shown in Figure 5. 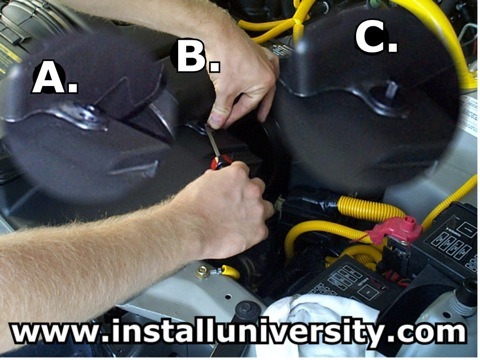 You can see an example showing how to remove the sensor connectors safely in Figure 6. Gently pull the tab out and lift the sensor out of the housing. 6. Go ahead and locate the rubber flexible hose that runs from the MAFH to the throttle body (TB) (see blue arrow in Figure 7). 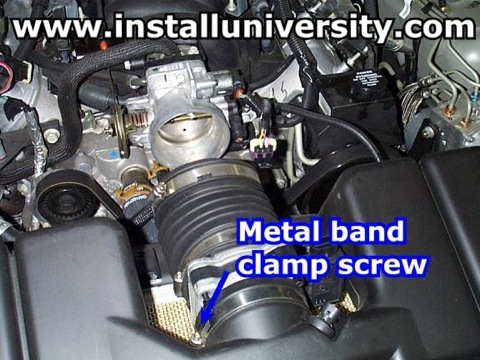 Take a flat-head screwdriver and loosen the metal clamp. 7. Grab hold of the air box, lift and pull towards you (see Figure 8). 8. Before you get excited, be very careful with the MAF sensor. Don't touch ANY of the little thin wires (see blue arrows in Figure 9). You will screw it up and cost you major bucks ($$$) to get a new one. 9. Take a flat-head screwdriver and loosen the metal band clamp that fits over the air box lid neck that connects to the MAFH (see blue arrow in Figure 10). 10. You need to pull the MAFH out of the neck on the air box lid (see Figure 11). This might be a very hard step to complete. The MAFH is very stubborn to come out. We heated the neck of the air box lid using a hair dryer and the MAFH finally came out. DO NOT PUSH on the MAF screen from the inside of the air box lid! That will damage the screen and that is the last thing you want to happen. 11. This step will also be a hard step. 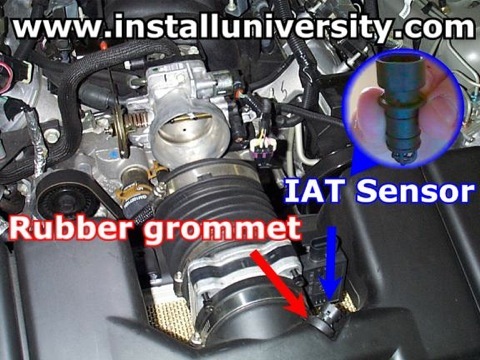 You will need to remove the IAT sensor and rubber grommet from the factory air box lid (See Figure 12). 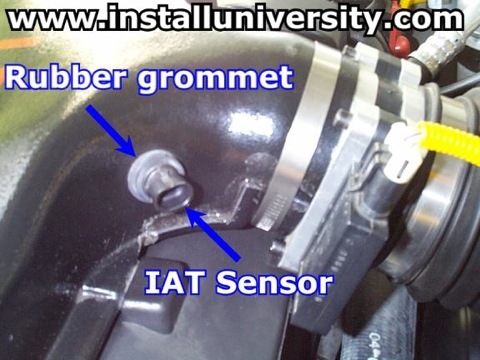 We suggest buying another IAT sensor and rubber grommet from your local GM dealership. The part numbers are listed at the top of this install in the Tools and Materials. This step was much harder for us than removing the MAFH. However, if you want to use the factory pieces then you will need to pull the IAT sensor out and remove the rubber grommet. We used a pair of needle-nose pliers. Be careful not to tear the rubber grommet! 12. You will need to place the rubber grommet and the IAT sensor in the whisper lid (see blue arrows in Figure 13). This will be easier than taking them out. You just have to move them around a bit until they slide in. The IAT sensor will be difficult to slide in so be ready to spend some time on it. Be sure you turn the IAT sensor so the part number is facing upward. 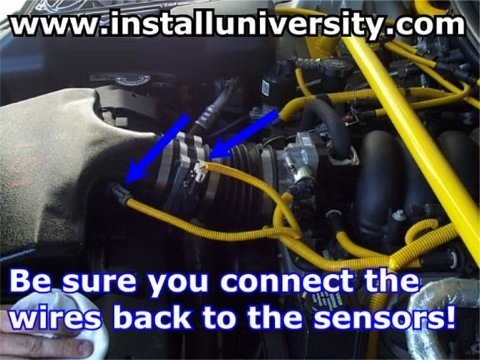 This will ensure the sensor connector will be turned the correct way so you can get to the release tab in the future. 13. Take the metal band off the air box lid neck that you loosened up (if the Whisper lid did not come with a metal band clamp) in Step 9 and place it on the Whisper Lid's neck. Slide the MAFH back into the whisper lid and tighten the metal band clamp using a flat-head screwdriver (see Figure 14). 14. 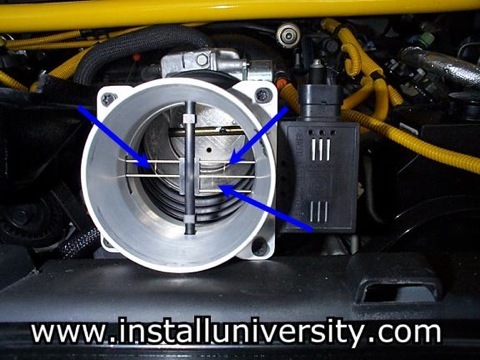 Grab hold of the whisper lid (in the same manner you grabbed the air box lid in Step 7) and push the rubber boot back on the throttle body. 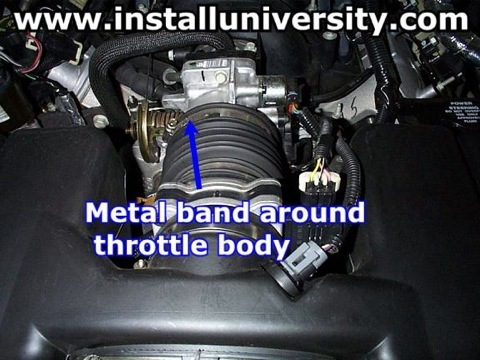 Make sure you get the rubber boot all the way back on the throttle body. Then tighten the metal band clamp on the rubber boot (see blue arrow in Figure 15). 15. Reconnect the wires to the IAT and MAF sensors. 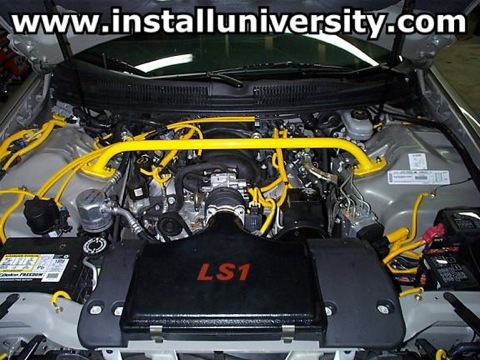 If you do not you will get the Service Engine Soon (SES) light on your dashboard. No big deal but it is nice to avoid the hassle if you can. If you do set the light you can reset your PCM by using the steps mentioned in the Reminder. 16. Place the tabs of the air box into the small holes (see blue arrows in Figure 17). Push back on the box to get the tabs in the holes good and snug. 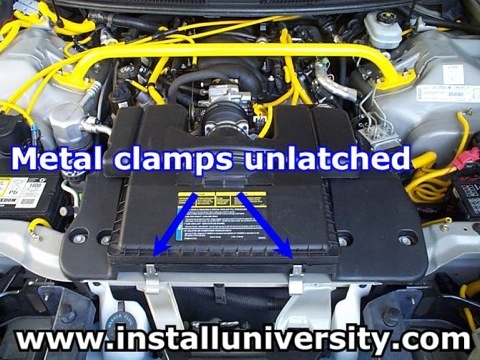 Lower the lid and put the clamps back on the air box. 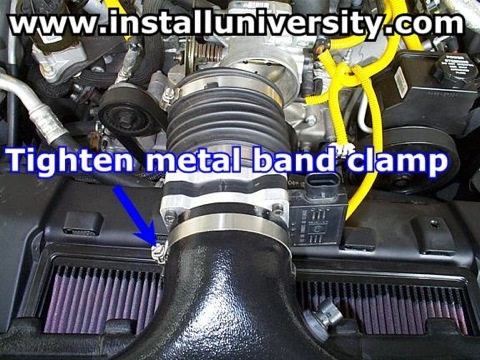 You might have a little problem getting your metal air box clamps to stay shut. Just make sure you push the lid far enough back. If you have problems with the metal clamps staying shut, be sure to get the upper lip of the whisper lid behind the lower lip on the lower air box assembly. The lid will get easier to take on and off once it has been installed on the car for several weeks. Comments: Look at our finished install (See Figure 18). The lid really cleans the engine compartment up and gives you some extra horsepower to go along with the looks. At the time we completed this mod we had no other performance modifications. We could tell a noticeable difference in throttle response and additional horsepower. We experienced a slight "whistling" type sound from time to time. Don't worry about that sound if you experience it. The sound occurs because we removed the silencers on the air box lid assembly.